When inserting an image into the blog post, you want to make sure the image is compressed to keep the page loading time as fast as possible, or the readers maybe leave away quickly. There are many image editor softwares such as IrfanView can do the compression job, but let’s try some simple and useful online image compressors now. You can either enter an image URL or upload an image to be compressed, and you can also convert the image to JPG, GIF or PNG file. There are different compressed images with different qualities for preview before downloading. 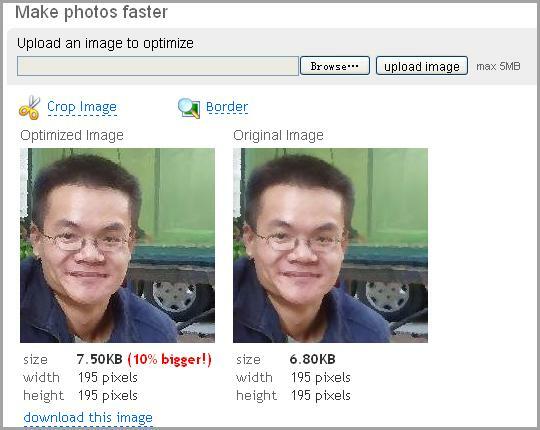 Online Image Compression is used to compress (or convert) images into the JPG image format easily. But sometimes, the compressed images will be larger than the original ones. For PunyPng, the sizes of the compressed images are always smaller than or at least same as the original ones. You can upload bulk of images and then download them at a time after compression. But you can not choose the format of the compressed image, for example, the original GIF file maybe compressed to a PNG file, and you have nothing to do with it. Smush It allows you to compress the online images “lossless”, the GIF file will be also converted to PNG file once compression. Besides compression, you can also change the image size, color, border, and so on. The compressed image will be kept the format as it is, but may be bigger than the original one. My favorite online image compressor is PunyPng, what is yours? 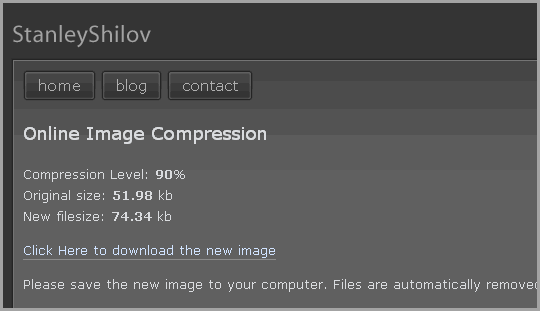 Please let us know if you have any other similar online image compressors. This entry was posted in Free Online Picture Tools and tagged image compressors. Bookmark the permalink.